Whether you’re currently in the middle of a pregnancy or you’re a regular sufferer of back pain, you’ve more than likely heard of the comfort that a good body pillow can provide. You might be wondering what exactly a body pillow is and how you find the good body pillow to deal with your pregnancy or back pain. We know how difficult it can be to find the right body pillow to suit your needs, which is exactly why we’ve put together this ultimate guide to buying the most comfortable body pillow. Whether you’ve owned a pillow before or you’re new to this form of pain relief, you’ll definitely find this guide to be a useful resource when it comes to picking the best option. You’re likely already aware by now that there’s a bit of a difference between a standard body pillow and a pillow designed specifically for maternity. Whilst the above product was our best choice in terms of overall body pillows, this Leachco Snoogle Total Body Pillow is our top choice for a body pillow during pregnancy. So what makes this one of the #1 body pillows for pregnancy? This means that the product was designed by someone who really knows what they’re doing. It uses a unique patented design that you won’t find with any other body pillow on the market. Plus, there’s adequate functionality for cooling, so you can even use it during the summer. Despite being pretty expensive, customers love the material used in the creation of this body pillow and are incredibly happy with the level of support that it provides. Highly affordable than most body pillows. Uses a unique patented design that has been developed by both a registered nurse and mum. Comfortably support your hips, back, neck and tummy at the same time. It keeps its shape for long time usage. Quite difficult to change the pillow cover. Large and hard to store. As you can likely tell from the contents of this article, Leachco are a pretty popular name when it comes to body pillows designed to provide support during pregnancy. This snuggle body pillow continues their trend of great quality products. It’s considerably more expensive than the other Leachco products that we’ve taken a look at and in fact most maternity pillow options on the market. Whilst the Leachco Snoogle Chic Jersey Total Body Pillow is going to cost you a little bit more, you really are paying for quality here. The pillow uses a really nice knit cover comprised of 60% cotton and 40% polyester jersey. If you really care about the quality of the material coming into contact with you and your baby, this is the maternity body pillow for you. In comparison with other L﻿﻿﻿﻿eachco Body Pillo﻿﻿﻿﻿w, this one is quite different, as it actually works as a pretty effective body pillow for back pain too. The fabric's very soft and comfortable. The shape of the pillow is great to deal with the pains and discomfort of pregnancy or just to deal with back pain. Only available in Heather Grey colour option. Up until this point in the article, you’ve likely been lead to believe that we’ve completely overlooked the U Shaped full body pillow. Whilst the C shape is fantastic, for some people, their best option is still to opt for a U shaped body pillow. As we’ve already mentioned, both of these pillow shapes are actually pretty similar. However, one obviously features a C shaped design, whilst the other provides a U shaped design. When it comes to body pillows that use a U shaped design, this Comfort-U Total Body Pillow is without a doubt one of your best choices. The design of the pillow allows you to provide complete and total support for your pillow with head to toe comfort. This pillow is ideal for back, neck and shoulder pain. Whether you’re struggling from discomfort of pregnancy or just struggle to get to sleep at night, it’s hard to deny that this isn’t the top body pillow for back pain. It's always soft, fluffy and totally hypoallergenic. Ideal for back, neck and shoulder pain. Very flexible to use for any height and sleep position. In order to maintain its shape, you should fluff it regularly. Large and hard to store - one of the largest body pillows on the market. We believe this J-Shaped body pillow perfectly rounds off our list of reviews of the top 5 body pillows on the market. At first, you might think that a J shaped product is a pretty strange choice for a body pillow. However, you’ll quickly find that the shape really does work, especially during the maternity process. That being said, this isn’t just a body pillow for pregnant women, you’ll find that it can also be used to deal with sciatica, heartburn, carpal tunnel, nasal congestion and a range of different problems. As far as pillow shapes go, we can definitely say that this J shaped option from Web Linens Inc. provides the most comprehensive treatment. That being said, you don’t necessarily need to be suffering from one of the above medical conditions in order to make full use of this pillow. It’s also our body pillow pregnancy best option if you’re just looking to deal with the discomforts of pregnancy. The unique shape and design of this pillow is designed to provide equal measures of support for the back and belly. If you’re worried about your pregnant belly though, there’s little reason to be, considering the extra spacing provided by the pillow. It's very long and super comfortable to use. Whether you suffer from sciatica, heartburn, carpal tunnel or nasal congestion, you’ll definitely find that this body pillow can go some way to helping with your condition. Included with the pillow is a removable zippered protector. This makes it much easier to both clean and keep the pillow clean. For its price, there're better options to choose. It is quite difficult to get used to a big pillow like this. As aforementioned, over the course of this article, we’ll not only be providing some useful advice around picking a body pillow but also reviewing a few of our favourite products in the category. As a good all round general body pillow, we thought the best place to start is with this Aller-Ease Cotton Hypoallergenic Allergy Protection Body Pillo﻿w. Coming in at around 20” x 54”, it’s a pretty standard pillow to provide support and comfort, night after night. One of the biggest selling factors of this pregnancy body pillow is the fact that the pillow is completely allergy free. Mainly because the product is filled with a hypoallergenic fibre fill so that you can safely use it around your body and baby. This body pillow is without a doubt one of the safest options and we can only commend Aller-Ease for that. If you’re a sufferer of allergies, this is undeniably your best choice. Most affordable among all reviewed body pillows. 100% cotton cover with hypoallergenic fibre fill, designed to block out any microscopic particles that can trigger allergies and asthma, which is perfect during pregnancy. It's is machine washable and you can tumble dry it. Does not come with a pillow cover. Not enough stuffing and not fluffy. Before we take a look at what exactly you should look for when it comes to buying a good body pillow, there’s one important question that needs answering and that’s what is a body pillow. For some people, the answer to that question might be pretty obvious, but if this is your first pregnancy or you’re a new sufferer of back pain, it might not be so. Even though, there are 3 different types of pillows for pregnancy, a body pillow is essentially very similar to the pillow that you rest your head on when sleeping in bed. However, it’s an awful lot larger and designed to fit the whole body. Think of the comfort that a pillow provides to your head and a body pillow can provide that same comfort across your body. You might be wondering what exactly the purpose of such a pillow is, but such products have been proven to be effective in treating numerous pains. The general shaping of the body pillow is designed to provide a cradling effect that will help you drift off to sleep or just grab a quick release from that pain. When it comes to the different body pillows available, you’ll likely find that the average body pillow for back pain and body pillow for pregnant women are actually pretty similar in terms of what they offer. Many of the pains experienced by back pain sufferers and pregnant women are similar in nature and the pillow targets them in the same way. You’d be forgiven for assuming that the average body pillow will work for anyone and any pain. However, that couldn’t be further from the case. It’s important to study the different options available and choose a body pillow that works best for your pain. For example, those who suffer from overheating during pregnancy might also want to take a look at a cooling body pillow option. You’ll quickly find that each body pillow on the market offers its own unique properties and will work for different people. When it comes to relieving back or pregnancy pain, there’s a number of different options out there but a body pillow provides a good place to start. How Long is a Body Pillow? As we’ve already mentioned in an earlier section of this article, a body pillow is of course designed to provide pain relief across the body. Because of this, you can likely imagine that the pillow will be of a good size. However, there’s actually a lot more to body pillow measurements than you might think, with so many different options available. So what’s a good size body pillow to opt for and what are the most common body pillow dimensions out there? As aforementioned, there’s a range of different size options out there when it comes to buying a body pillow, should you need those sizes. However, you’ll most likely find that the majority of the body pillows available tend to be of a similar size. The most common option that you’ll find in most body pillows is the full length body pillow; as you’d likely imagine, this is a pillow designed to fit the full length of the body. The size of this type of pillow can vary, but you’ll find that they tend to come in at around 54” in length and 20” in width. As you can likely imagine, this is a size designed to suit the average body size. So if you suffer from back pain or you’re currently pregnant and either considerably short or taller than the average build, you might need a different option. When it comes to body pillows designed for different people, we’ve come across a number of the different options that offer a completely different experience in terms of size. For example, the king size body pillow provides a fantastic option for those of a larger build and looking to use a body pillow, as you can likely imagine. At the same time, it’s worth keeping in mind that you’re likely going to be putting on a lot of weight during the pregnancy process and with that in mind you’ll need something like a total body pillow for pregnancy. That being said, there’s definitely no hard and fast rule. If you’re completely new to the world of buying a body pillow, your best place to start is by taking a look at the standard 54” x 20” size. However, if you know that you’re going to need a little more space with your body pillow, don’t worry because there’s a range of other great options out there. In all though, remember that when you’re choosing the correct size of body pillow, it is a body pillow. This means that the pillow should be designed to provide comfort across your body, so don’t settle for a product that doesn’t provide that. It can sometimes be tricky to find the right size that works for you when it comes to buying a body pillow, but just be realistic and you’ll find the correct body pillow measurements. One of the most common uses for the average body pillow is during pregnancy. You’ll find that many pregnant women swear by their body pillow; but why are they so great when it comes to dealing with the pains of pregnancy? During the pregnancy process, your body suffers from a lot more pain that it might typically do. This is caused by the strain that the extra weight places on your body. Not only are you now supporting your own body, but also the weight of another being. That’s exactly where a body pillow comes in, helping you to support that extra weight. You’ll find that the most comfortable body pillow for pregnancy provides adequate support for your bump, meaning that you can rest easily without having to support for bump for a while. That being said, it doesn’t mean that a pregnancy body pillow is designed specifically to support your bumpy. It can also be used to just provide general relief to pregnancy’s pains. 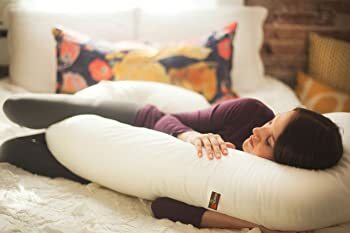 One of the best thing about choosing a body pregnancy for pillow is the fact that you can easily shape the pillow to support your body in whatever way you like. When you’re sleeping, the pillow should flex to suit the shape of your body and support you. However, you’ll want to keep in mind that the average body pillow for pregnant ladies takes up a fair amount of room in bed and won’t work so well for back sleepers. When it comes to dealing with the pains that come with pregnancy, there’s no denying that a body pillow is your best pick. However, you may be an aforementioned back sleeper or just not have an awful lot of room in bed. With that in mind, it might be worth looking into a wedge pillow to support your bump or alternative a shaped pregnancy pillow. Generally speaking though, the pregnancy process is undeniably one of the best times that you can take advantage of a good body pillow. You’ll comfortably find that most of the body pillow products we’ve featured in this article and on the market in general are designed to provide effective pain relief during the pregnancy process. However, you’ll need to take into careful consideration how much space you have and exactly how you sleep before deciding whether or not a body pillow is right for you and your baby. The above section concentrates on one of the biggest uses for body pillows and that’s during the pregnancy process. However, you’ll still find that the majority of body pillows out there doing a good job when it comes to providing relief for back pain. If you’re looking to invest in a body pillow for back pain, you’ll want to have a good idea of the different benefits offered by using such a product. In fact, just like with using one for pregnancy, there’s actually a range of different useful benefits. One of the most prominent of those benefits is the fact that the pillow provides you with full body support whilst you sleep. Because a body pillow is designed to be the length of your body, it provides you with the best sleeping position to deal with your back pain. That being said, you’ll want to make sure that you place the pillow between your legs to relief pain from the sciatica. If you find the top body pillow for back pain, you should also find that the pillow goes a good way to relax your muscles. There’s a good chance that a lot of your back pain comes from the muscles in your back being too tense. In order to deal with this, you’ll need to find some way to relax those muscles and a body pillow provides just that. The pillow should help to align your arms and legs, which should in turn introduce better blood circulation to your muscles and stop them from aching. We’ve already spoken at great length about the fantastic benefits a body pillow can provide during the pregnancy pillow. However, you likely didn’t know that body pillows for back pain and pregnancy can often tie in to provide the same thing. As most pregnant women are likely already aware, back pain is one of the biggest problems during pregnancy. However, because of the baby, you’re unable to take any medication to deal with the pain. With that in mind, your best option is to turn to a body pillow to support both your back and belly whilst you’re getting some precious sleep. Back pain is an incredibly difficult pain to work with and even after you’ve tried the different medications out there, you’ll still struggle to get a good night’s sleep. With that in mind, a body pillow might be worth your investment. There’s a lot of convoluting information out there when it comes to the proper way to maternity body pillows in order to alleviate the pains of pregnancy. Thankfully, our experts understand the best way to use such a product and generally make effective use of it. As aforementioned, the purpose of a body pillow during pregnancy is to deal with many of the pains and discomforts that you’ll come across during the process. With that in mind, your first step is undeniably going to be finding the source of that pain. During pregnancy, there’s a range of different body areas that can cause you some serious discomfort. The most common areas of pain during pregnancy include the ankles, knees, belly, back, shoulders and neck. There’s a good chance that your pain is coming from one of those areas of even possibly more than one area. Before getting started with using a body pillow for pregnant women, you’ll need to know where your pain is coming from. From here, you can likely imagine that you’re going to need to alter how you use a body pillow depending on the type of pain you’re suffering from during pregnancy. Whilst some best pregnancy pillows are specifically targeted at one area of the body, you’ll find that most options work pretty generally with most types of pain. A good example of this is using a pregnancy pillow to deal with neck pain. If you regularly suffer from neck pain during the pregnancy process, you’re going to want to use the pillow to support your head and neck as much as possible. This should in turn keep your spine as straight as possible and prevent neck ache. Furthermore, a similar technique is used when it comes to dealing with belly pains. Because of the added weight around the belly area, you’ll find the strain in this area causes a lot of pain. A wedge body pillow can be used to support your belly whilst you’re sleeping, which means that your bump isn’t pulling down on your back and causing you any unnecessary discomfort. The best bit about a body pillow is the fact that you can use it in order to support the entirety of your body. This means that if you’re suffering from a number of different areas of pain during your pregnancy, the pillow can definitely help. When it comes to dealing with the general pains of pregnancy, we’ve found that one of your best options is to place the pillow between your legs to generally relieve pressure on your joints. It’s this flexibility that makes a body pillow for pregnant moms undeniably one of your best options. In all, it couldn’t be easier to picking up a good pregnancy pillow to support you during pregnancy, however, it’s just not worth the effort if you’re not going to use the pillow properly. Depending on the type of pain you’re suffering from whilst pregnant, you’ll need to alter how you use a body pillow and where you place that pillow. If you closely follow these steps, you’re definitely going to get the most out of your product. Just remember to always get a good idea of the pain you’re targeting with your pillow. There’s a good chance that you regularly wash the majority of pillows in your home and that exact same principle applies to your body pillow. In fact, when you’re using a body pillow during pregnancy, you can likely imagine that it will need a more frequent wash. This is considering that during the pregnancy process, your body is more susceptible to germs and bacteria. You’ll want to keep your body and your baby as healthy as possible, so pay careful attention when it comes to how to wash a body pillow. The first step is to remember that you don’t need to wash a body pillow after every single that you’ve used it. In fact, if you pay careful attention to keeping your pillow generally clean, you might not need to wash it very often at all. If you’re looking to keep a body pillow clean, your best option is to choose an option that comes with a cover. As you can likely imagine, it can be pretty difficult to stick an entire body pillow in the wash. However, if you choose an option with a removable cover, you’ll simply be able to remove that cover and stick it in the washing machine to clean it. A cover also means that when your body pillow gets dirty, the pillow itself won’t absorb it. This in turn means that you’ll have a product that lasts longer. When it comes to actually washing your body pillow cover, the process will largely differ depending on the product. Before you get started washing, you’ll need to make sure that you check the tag on the cover. This will tell you if the pillow cover is machine washable or not, however, there’s a good chance that it is. If your pillow cover is machine washable, you’ll want to make sure that you wash it on a low heat and on its own. It might also be the case that you can machine dry your body pillow cover. That being said, we’d definitely recommend drying it in the open air where possible. As you can tell, there’s not exactly any special procedure when it comes to washing body pillows for pregnant women and as aforementioned, you might not need to wash your pillow all that often if you look after it carefully. A good way to do this is by preventing any dirt and dust from building up on the pillow. Give it a good shake off after you’ve used it and wipe away any spills as they happen. As we’ve already mentioned, there’s really no reason to give your body pillow a thorough wash following every time you’ve used it. Generally speaking though, just remember to apply some standard common sense when it comes to washing your body pillow. They’re a pretty expensive kit, so remember to take some time and remember to wash your pillow properly. Preventing the pillow from getting too dirty should also make that job an awful lot easier. Where to Buy the High-rated Body Pillows? If a body pillow sounds like a fantastic option for you when it comes to dealing with the discomfort of pregnancy back pain, you’re likely already wondering where can I buy a body pillow. Well, finding a retailer that sells body pillows is actually an awful lot simpler than you might think. Considering the popularity of such a product, you’ll find that a number of stores sell products in this line. Body pillows definitely aren’t hard to come by. When it comes to where to buy body pillows, we’d definitely argue that your best resource is the internet. You’ll find a number of large online retailers, including most notably Amazon that sell a range of different body pillow products. In fact, taking a look at the different options below, you’ll find that all of them are available to buy online. One of the best things about using an online retailer to buy your body pillow is that you can use their website to check out reviews of the product and decide whether or not it’s right for you. If you prefer not to purchase products online or just don’t have the means to do so, it’s still more than possible to purchase a good body pillow in store. If you’re looking for a body pillow to use specifically during the pregnancy process, a maternity store might be your best option. However, you’ll likely find that most home stores offer a similar range. Obviously, the great thing about buying a body pillow in store is the fact that you can see how the product looks and feels. It means that you can also check for extras with the product and whether or not it includes a pillowcase for body pillow. What to Look for When Buying the Top Body Pillows? If you want a body pillow to be completely effective in terms of the support it provides you when dealing with pregnancy discomfort or back pain, there’s a number of key things to look for and take into consideration when buying. If you’re looking to find a top-rated body pillow, we’ve put together some of the key things that you’ll want to look when buying a good product. It might be the case that you already have a good idea of the brand you’re looking for when it comes to buying a body pillow. As you can likely imagine, there’s a number of different brands out there when it comes to buying such a product and over time, you’re likely going to gain a favourite. You should also keep in mind that different brands specialise in creating body pillows for different uses, whether it be during pregnancy or for back pain. Some of the most common brands you’ll come across when looking for a good body pillow, include the likes of Pinzon, Co-Op Home Goods, Aller-Ease and many other big names. We’ve only featured pillows in this article from names that we trust, so if you have no idea of the brand you’re looking for, we’ve got you covered. It’s pretty easy to recommend the top body pillow that you can buy and if we did so, there’d be no need to provide a number of pregnancy body pillow reviews. It’s impossible considering the different budgets that different people have to work with.If you don’t have a huge budget to spend on a body pillow, that doesn’t mean that you aren’t going to get a good quality product. However, when you’ve got more money to spend on a body pillow, you’re going to get what you pay for. When you’re buying a body pillow, you’ll want to take into consideration just how much spare money you have to spend on a body pillow and make sure that it’s not setting you back too much. When you look at the average body pillow, you’d be mistaken for thinking that they’re all designed with the same materials. However, that couldn’t be further from the case. The material that your body pillow is made with is likely to largely depend on how much you’re spending on the body pillow. If you’re using the pillow during the pregnancy process or once you’ve just given birth, you might want to spend the extra bit of cash and choose an organic body pillow. However, you’ll also find pillows that use a range of different materials. The likes of shredded memory foam a less comfortable but provide more support, whilst more traditional filling on the other hand will give you a comfortable position. The material filling that you choose for your body pillow is completely up to you and what you’re looking for. However, you should always take into consideration what you’re using the pillow for. As aforementioned, size is a big factor that you’ll want to take into consideration when it comes to buying a good body pillow. As the name suggests, a body pillow is designed to fully fit your body. However, there’s still a range of different sizes available that you’ll need to take into consideration when buying. For example, depending on how much space you’re going to need when using the pillow, your best option might be to choose an oversized body pillow.What’s more, if you plan on using your pillow during the pregnancy process, you’ll need to decide what area of the body you’re planning on targeting with the pillow. If your pain is more general and you’re just looking for some more comfort, your best option might be to choose a full length body pillow. If you don’t know what you’re looking for in a body pillow, this is a good size to start with. There’s one final key thing that you’ll want to look for when buying a good body pillow and that’s the shape of the pillow. If you’ve already looked into buying such a product, you’ve likely noticed that they come in all sorts of different shapes. There’s a lot to consider when choosing the appropriate shape body pillow. Many of the most popular products are a pretty standard pillow shape. This is likely your best option, unless you’re looking to target a specific area of pain that is. If that’s the case, you might want to opt for a wedge pillow or smaller option to provide added support. At the same time, you’ve likely already noticed unique letter shaped pillows. These types are largely targeted at different body types and pains, so consider what you need carefully. As aforementioned, there’s a range of different unique shapes available when it comes to buying a body pillow. One of the most prominent of those shapes is the C Shaped Body Pillow and considering the features offered by the pillow, it’s easy to see why. It’s worth keeping in mind that the pillow itself is actually pretty similar in nature to the standard straight body pillow. However, there’s one key difference in the respect that the pillow has been designed to resemble the shaping of a letter C.
The idea behind the shape of this pillow is that it can be used in a riding position. You place the body of the C between your legs and use the top of the pillow to rest your read. Because of its unique shaping, this pillow is able to comfortably target your spine and relieve the pressure that pregnancy places on it. Unlike a U shaped pillow, a C Shaped option largely targets a specific area of the body and not your general posture. It is worth keeping in mind that C Shaped pillows are designed with pregnant women in mind. Because of that, you might not necessarily find them to be the best option when it comes to dealing with back pain and other discomforts. Unique C Shaped design allows for one of the most comfortable body pillow types whilst still providing the support that you need. If you plan on using the pillow after you’ve given birth to support your baby during feeding, you’ll find this to provide the most support in a pillow. The pillow allows you to rest just about every aspect of your body, including your head, meaning there’s no need to invest in an additional body pillow. Design of the pillow is perfect for those who prefer to sleep on their side. Which means it obviously doesn’t work so well for straight and back sleepers. C-Shaped body pillow is pretty big and bulky, especially in comparison to some of the other pillow shapes. If you plan on taking your pillow with you when you travel, you’ll definitely struggle to do so with a C Shaped pillow. Whilst being one of the most bulky types of pillow you can find, C Shaped pillows also tend to be pretty expensive and are often the most expensive of their type. If a C Shaped body pillow doesn’t sound like its completely right for you, a more solid option might be the U Shaped full body pillow. You might not be already aware, but a U shaped body pillow is actually used in a pretty similar way to the mentioned C shaped variant. However, because of the shaping of the product, it provides support for both sides of the body and not just the back like a C Shaped variant does. As aforementioned, the C Shaped variant of body pillow was designed to provide support for your head, without the need for an additional pillow. This U Shaped option does the exact same thing, whilst also providing more support across your body. If you’re very keen on as much of your body being supported as possible, this is the option for you. That being said, one of the biggest problems with a U Shaped body pillow is that you’ll need to be able fit your body within the space allotted by the pillow. Whilst the C Shaped option gives you extra space for your belly at the font, the U Shaped option can’t do this. From just taking one look at a U Shaped body pillow, you’ve likely already got a good idea of exactly how you’d use such a product. This particular body pillow shape is designed to be straggled, much like if you were hugging onto a tree. The support on both sides of the pillow also means that it gives the effect of sleeping on your back. We can comfortably say that a U shaped body pillow offers the most flexibility in terms of compatibility. You’re definitely getting more support for your money with this option. This is largely down to the fact that the pillow provides full support on both sides of the body. The fact that the pillow provided support on both sides of the body means that it will give you the full effect of sleeping on your back. If you prefer to sleep on your back but can’t do because of pregnancy, this will allow you to do just that. Provides some of the most comprehensive support that we’ve seen from any type of body, including a specific space for the head. More expensive than most other shaped pillow. This is yet again another bulky option. If you’re planning on taking the pillow with you when travelling, this definitely isn’t going to be the most conventional option. If there’s one thing that you’ve learnt from this article, it’s that there’s a range of different shaped products available when it comes to body pillows. The majority of those shapes are based on a letter of the alphabet and the I Shaped full body pillow is no exception. As far as body pillow shapes go, the I shape is undeniably the simplest option. However, that’s not necessarily a bad thing. When you have a body pillow with a pretty simple shape, you’re going to find that the pillow is easier to adjust to your needs. Whether it’s for supporting your back or providing a bit of comfort whilst sleeping, you can switch and change the position of your I shaped pillow to provide just that. If you’re looking for a good simple body pillow and you’re not too fussed about some of the fancy shapes we’ve seen, this pillow is going to provide just that. Unlike some of the more uniquely shaped pillows on the market, you can adjust this particular body pillow to your liking. I Shaped body pillows are usually cheaper than other shape options. At the same time, they’re one of the most popular options so there’s plenty of material choices available. If you’ve got a particular pain or need the unique shaping provided by some of the other letter options, you’re not going to find it here. The I-shaped pillow is designed to look and feel like the pillow that you place your head on, so don’t go looking for it to provide any extra support when using it for pregnancy or back pain. When it comes to the materials used in the filling of body pillows, we’ve already mentioned that there’s a good few options available. Which option you choose will largely depend on how much you have to spend on a pillow and what you’re looking to get out of it. That being said, a microbead body pillow is without a doubt an all-round great option. The clue is truly in the name when it comes to this type of pillow and that’s the fact that the pillow uses a microbead stuffing. The great thing about this type of filling is the fact that the pillow is incredibly flexible. If you struggle to get comfortable when using a body pillow, you’ll definitely find this pillow easy to move around with and truly get comfortable. Other than that, you’ll find that the average micro bead pillow offers largely the same benefits of any other type of body pillow on the market. They are arguably the most flexible option on the market when it comes to body pillows, meaning that even if you struggle to easily get comfortable, this pillow should definitely help. It also tends to be considerably cheaper than some other options on the market. They’re still available in many of the same shape options as you’d find other pillows in, so you don’t need to worry about missing out in terms of shape. Microbead stuffing doesn’t seem to provide the same level of comfort and support as some of the more padded options do. If you’re looking for a pillow to truly relax in, you might find a more traditional and organic stuffing to do a better job. When it comes to the materials used in the production of body pillows, you’ll find that the different options are split into natural and synthetic choices. You might have an idea of what type of materials you want to have around you and your baby. That being said, a feather body pillow is one of your best choices when it comes to a natural option. As you can likely already imagine, the average down body pillow uses some form of natural feather based filling. This might even be goose feather filling, in which case, you’ll find that the pillow is marked as a goose down body pillow. It’s worth noting that down feather only relates to the filling of the pillow. No matter what the material, you’ll find that most pillows still stick to a pretty standard cotton or similar material covering. Whether its goose feather or just about any other form of feathering, you’ll definitely find this to the most natural option. If you’re keen on only using natural materials around your baby, down feather is worth looking at. Feather pillows generally tend to last much longer than synthetic options and also tend to be much easier to clean. It’s because of this that many people swear by feather filling when it comes to any type of pillow. Feather filling also makes your pillow much more lightweight. This means that you can comfortably transport and take your pillow with you. Whilst feather filling in a body pillow largely tends to be pretty comfortable, you might find that sometimes the hard parts of the feather stick through. This might become something of a problem if you’re using the pillow around children. When it comes to an organic body pillow, the name pretty much suggests that you’re going to be getting your hands on a good quality product. When using such a product around their baby, some pregnant women remain insistent on using only organic materials. If you’re one of those mothers, you’ll want your body pillow to only use such a material. That’s quite rightly so, considering there’s a range of benefits to choosing an organic filling. When it comes to purchasing a pillow that’s made with synthetic materials, you’re never quite sure what chemicals and pesticides have been used whilst producing the pillow. However, organic materials allow you to take advantage of nature when it comes to the body pillow you use around your baby. At this point, it’s also worth mentioning that an organic body material doesn’t just relate to one type of material filling. There’s a range of different materials out there that are considered to be “organic”, so even if you’re allergic to a particular material, there’s definitely going to be an organic pillow that works for you. That being said, whatever pillow option you choose, always make sure to carefully check what the actual filling is – especially if you suffer from allergic reactions to a material that could have been used in the pillow. Unlike many of the synthetic filling options out there, organic body pillows are designed to use only organic materials. If you particularly care about the materials near your body and baby, you’ll find to take advantage of this. When you think of organic materials, you likely think that your options are pretty limited. However, organic body pillows actually come in a number of different shapes and sizes, so you can choose a material that works for you. Many users of both standard organic pillows and organic body pillows believe that their filling makes them an awful lot more comfortable than some of the synthetic filling options that you’ll come across on the market. Much like with any organic product, you can expect to pay a considerable amount for a body pillow that uses organic filling. With that in mind, you’re going to struggle to buy an organically stuffed pillow if you have a particular budget to stick to. Throughout the course of this article, we’ve discussed the ins and outs of normal body pillows and pregnancy pillows. However, what’s the difference between the two? Well they both largely intend to offer the same thing, but there are some differences in the way that they go about it. It’s important to gain a good understanding of these differences before looking for the best maternity pillow and generally deciding which option you need. The key difference between these two pillow types is the fact that a pregnancy pillow is designed for use during the pregnancy process, whilst a normal body pillow is pretty obviously just designed for general use. In terms of specifics, you’ll find that a body pillow during pregnancy is designed to better suit the shape of a pregnant body. Whilst you should be able to use a standard body pillow when you’re pregnant, you might notice that a maternity variant is more compatible. This is largely down to the fact that the shape of your large body will better fit in it. Some pregnant women would also argue that a normal body pillow doesn’t necessary feel to provide a level of support on the same level as a pregnancy pillow. Because of this, they need to use a series of additional pillows to provide the support that they need. This like many of the other differences show that only really pregnant women will be able to tell the difference. If you’re looking for a body pillow for back pain, you’ll still be fine to opt for a pregnancy pillow. In fact, you may even find it to provide extra support. Finding the best body pillow is all well and good, but you’ll first want to take into consideration why you need one. To complete this article, we’ve put together 5 compelling reasons why you shouldn’t delay and just buy a body pillow today. There’s no denying it, the pregnancy process is an incredibly uncomfortable time. You’re going to go through a fair amount of discomfort whilst you’re pregnant with your child and that’s completely natural. However, picking up the best pregnancy body pillow could mean that you’re given a bit of comfort where you wouldn’t necessarily find it. Whether you’re trying to get a good night’s sleep or just want a bit of comfort at the end of a long day, it’s surely worth your time to buy a body pillow today. When you’re pregnant or just dealing with a particularly difficult pain, one of the hardest aspects of life is just getting a good night’s sleep. There’s no guaranteeing that a body pillow will provide you with that, but it should go some way to improve your sleeping. In fact, you can wrap your body around your body pillow in just about any way you like; you should quickly find that the pillow helps in getting you to sleep and keeping you asleep. In order to be efficient in your day to day life, a good night’s sleep is essential. After you’ve had a bad accident, the rehabilitation process can be a very difficult time. It’ll likely take a good while for your body to get back to normal, but did you know that a body pillow can help with that? Not only does a body pillow help soothe the pains produced as a result of your accident, but it also helps to improve your stability again. It goes without saying that a body pillow isn’t going to offer a one-stop solution to deal with your accident rehabilitation, but it should go some way to help. When it comes to using a body pillow during the maternity process, its uses don’t stop once you’ve given birth. Any good body pillow should also be able to provide you and your baby with support whilst you’re nursing and feeding the baby. If you’re looking for a body pillow to do specifically that, your best bet is a C or U shaped option, but anybody pillow should be useful in providing this. Take a look at our pregnancy body pillow reviews for some of your best options during maternity. The last of our 5 reasons why you should buy a body pillow won’t necessarily relate to everyone. However, many users of body pillows find that they relax muscles and in turn increase circulation. If you suffer from particularly tense muscles of bad circulation, it definitely couldn’t hurt to try and use a body pillow to deal with your problem. Plus, you should also be able to take advantage of some of the other aforementioned problems at the same time. In conclusion, there’s a lot more to the average body pillow than you might have thought. Whether you plan on using your pillow to deal with back pain, the discomfort of pregnancy or just about anything else, hopefully this article has provided you with some useful advice. After hours of researching, we've come to conclusion that the Leachco Snoogle Total Body Pillow is the #1 body pillow on the market right now. This pillow can alone support your hip, back, neck and tummy. Most importantly, it will keep its shape for long time. My sister is pregnant now, I’ve been looking for the body pillow for one month but I couldn’t find the best one. After reading this post, I was clear and your guide helped me to pick the most comfortable body pillow. Thanks for this informative post! Keep sharing! !